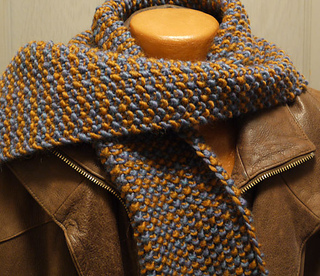 The scarf in the top photo is from the version of the pattern included in Quick + Easy Knits (from Interweave Press). 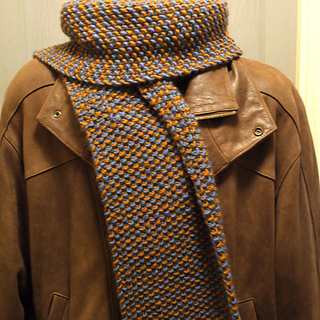 The scarf in the next three photos was made for a man, and knit on #13 needles with a gauge of 3 stitches to the inch. 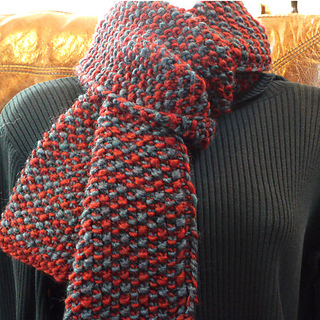 This finished scarf measures 8 1/4” wide and 60” long. It took approximately 160 yards of each color. 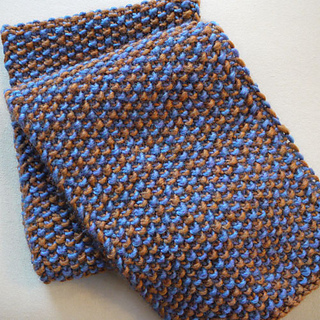 This pattern, designed and written for newer, as well as more experienced knitters, contains a step-by-step tutorial for designing the scarf to fit your own yarns and desired dimensions, as well as directions for making it as pictured. The pattern also contains illustrated instructions on carrying yarn up the side to make a neat edge.